In May of 2012, Portland Bolt supplied the galvanized hardware for a new pedestrian bridge in Milwaukee, Wisconsin. The 96 foot long, 23 foot tall, 36,000 pound bridge connects the playing fields behind Riverside High School with the trails that wind through Riverside Park. The new pedestrian bridge was installed over the Oak Leaf Trail. 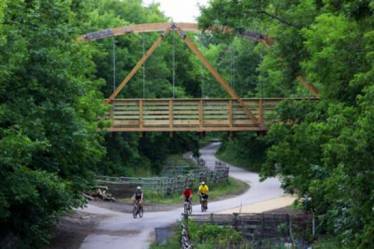 This bridge is part of a park access plan created by the Urban Ecology Center, Milwaukee County Parks and other community stakeholders and is incorporated into the Rotary Centennial Arboretum scheduled to open in Fall 2013. One of the strict requirements of this project was that all product per specifications had to be fully domestic. Portland Bolt supplied 414 galvanized headed bolts, 36 galvanized rods, 596 galvanized square plates, along with all the corresponding nuts and washers, which amounted to 3,600 pounds of domestic hardware. All product, aside from the nuts and standard round washers, were manufactured in Portland Bolt’s 94,000 square-foot facility including the galvanizing and plate fabrication, showing once again the capabilities that Portland Bolt brings to the market.